Do you think a disaster won’t happen to you? Or, do you think it might, but there’s nothing you can do? This article is for you and anyone else needing a reason to be prepared for disaster! Would you like to print this list? Here you go! Yes, you can save money by being prepared. If you understand your community’s greatest risks, you can take steps to make your home and property more resistant. For example, you may qualify for a reduced insurance rate if your home and property are resistant to damage from weather-related or other types of disasters. You may also have fewer damages to repair if disaster does strike. What risks do you face? Enter your ZIP code to find out on DisasterSafety.org (scroll down to Discover the risks you face). Check with your county or parish Emergency Management Agency for local specifics, and then take action to save money by being prepared. 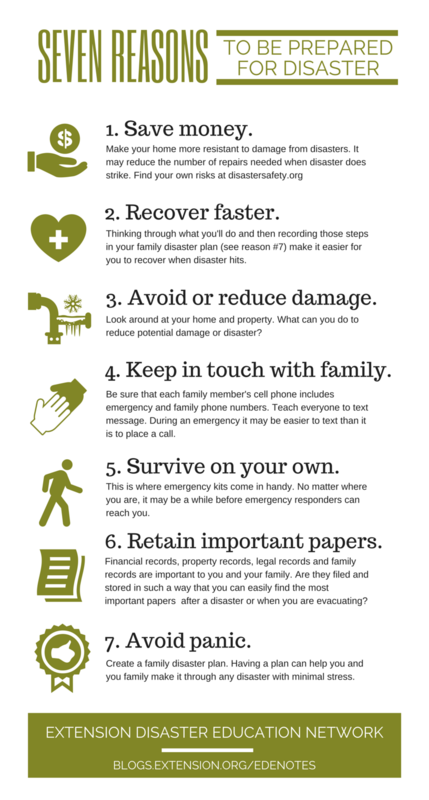 Thinking through what you’ll do and recording those steps in your family disaster plan (see reason # 7) make it easier for you to recover after a disaster hits. For example, does everyone in your household know what to do if a flash flood is about to affect your home and property? Look around your home and property. What can you do to reduce potential damage from a disaster? You can strengthen your house structure to protect against a shift from flood or wind forces, develop a firewise landscape, take steps to prevent home fires, and take other actions to make your home and property more secure. Be sure that each family member’s cell phone includes emergency and family phone numbers. Teach everyone to text message. During an emergency, it may be easier to contact others via text message than it is via a call. Also keep an up-to-date paper list of key phone numbers. If power is out and your cell phone is not charged, you will still be able to locate a needed phone number. It’s easier to contact relatives during a disaster if you’ve created a contact list before the disaster. They’ll want to know that you’re okay, so have a plan for notifying them. That plan may include contacting a designated out-of-state relative or friend who will let others know your status. You might also use the American Red Cross Safe and Well website. This is where emergency kits come in handy. No matter where you are, it may be a while before emergency responders can reach you. Here’s a starting list for your household supply kit. Financial records, property records, legal records, and family records are important to you and your family. But are they filed and stored so you can easily find the important papers after a disaster—or when you’re evacuating? These papers will make it easier for you to recover. Here are some tips on organizing, managing, and accessing your papers. Create a family disaster plan. Having a plan can help your family make it through any disaster with minimal stress. A comprehensive family disaster plan includes information about each family member, household pets, insurance and finances, and the home itself and its contents. Most important, the plan outlines what each family member should do during an emergency and identifies safe places inside and outside the home. Here’s a family disaster plan template from the University of Missouri Extension. What are some reasons you have found for being prepared for disaster? And here’s a pin for you, too.